After I attended a canning workshop on Thanksgiving weekend, I was so excited to put up my own treats — I’ve had dreams of jars of jams, marmalades, and tons of pickles. I think next summer is going to be my first real summer of canning, where I can make the most of the amazing local produce available to us here in Ontario. But until then I wanted to do some of my own canning. On the recommendation of my canning instructor (Janet Nezon from Rainbow Plate), I put Marisa McClellan’s Food in Jars onto my wishlist and my fabulous sister surprised me with it for my birthday! 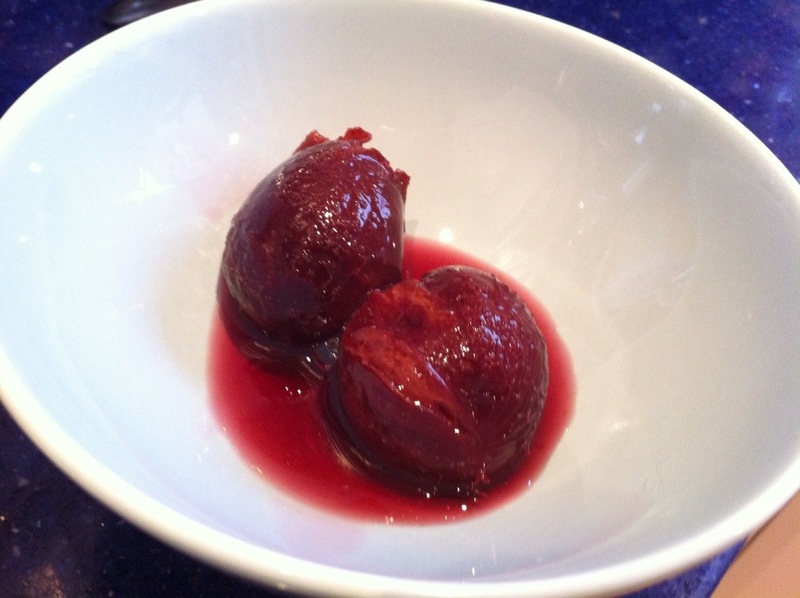 Marisa also runs the fabulous blog Food In Jars, where I spotted a recipe I knew I had to make: Plums in Honey. One of the easiest ways to preserve fruit is to cover it in a sugary syrup — and this recipe took it one step further and used a honey syrup. I think this was the perfect recipe for my first canning experience: it’s easy, hasn’t got a lot of steps, and WOW! does it ever make delicious plums. My friend Nicole and I opened a jar on our Christmas-themed Saturdate, and these will be so perfect for the holidays. In fact, I think these are an improvement on sugar plums (candied dried fruit) — I definitely have visions of honey plums dancing in my head. I used the lusciously dark purple Italian prune plums that I love so much. Whenever I see them I need to buy a basket. Usually they go into a “Bum Cake” but this year I wanted to save them to have in the middle of winter. Voila — the whole raison d’être of preserving. Marisa says in her recipe that you don’t need to pierce the skins, but mine burst a little bit. I don’t think I’d pierce them next time either, but if you’re picky about the skins bursting, you may want to go forth and pierce your plums. If you make these, be sure to take a moment to yourself when you first open the jar. I waited a month to fully anticipate the moment — the smell is just to-die-for. It’s the anise-cinnamon combination that will instantly make your home more festive. I’m planning on serving these either with a cheese plate, or over a good vanilla ice cream. That’s if they make it that far… I seem to be eating them straight out of the jar! Bring a canning pot filled with water and your 3 x 500ml jars to a boil. Boil jars for 10 minutes, then remove and set aside. Keep the water boiling to process your plums. In a separate small saucepan, cover your 3 canning lids with water and bring to a simmer (trying not to boil them). While the jars and lids are bubbling away, create your honey syrup: Combine honey and water in a small saucepan and bring to a boil. Into your jars, place your plums, and pack them in tightly. Add a cinnamon stick and a bit of star anise to each jar. 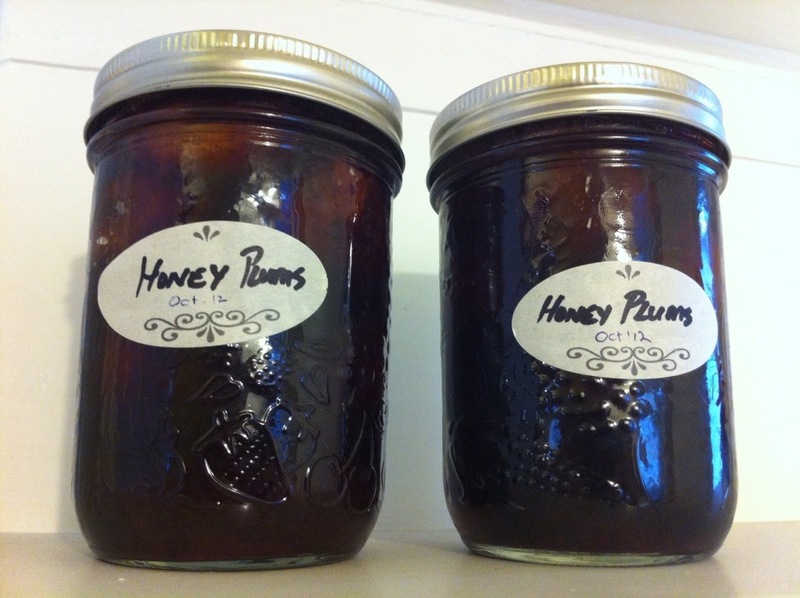 Fill the jars with the honey syrup, and leave a 1/2″ (1.25cm) headspace. Poke around each jar with a chopstick to remove any air bubbles. Double check to make sure you have a 1/2″ headspace, and top up with more honey syrup if you need to. Wipe the rim of each jar to clear off any honey syrup drips. Put a lid on each jar, and screw on a ring to each jar, tightening down to finger-tightness. Place your jars on top of a rack in the boiling canning pot, and let boil for 25 minutes. Carefully remove the jars and place them in a convenient location on a dishtowel. Don’t touch the jars for 24 hours! I like to stick around to listen for the “pop” that says my jars are sealed! After 24 hours, remove the rings from the jars, and check your seals — the lids should be concave. Store without rings in a cool and dark place for up to one year. I’m too chicken to try canning… but these look *so* good! I was too, Kim — but if you follow the recipe you’re safe. Marisa’s book gives really good how-to instructions. Or if you’re concerned you can keep them in the fridge and eat them quickly. I am so happy to hear that you’re enjoying those plums so much! Oh they are just divine — thanks Marisa for such a wonderful recipe!! Woohoo Lindsay! I feel like a proud Mom! They look gorgeous, and I can just imagine how they smell and taste. I’m so glad that you got Marisa’s book too. It’s wonderful, isn’t it? As it happens, I’m teaching hands-on canning classes this weekend and next. I’ve still got a few spots left if anyone’s interested. We’ll be making some delicious holiday gift items. Keep up the great work!